Come join us for a game of Pool at Snookercentrum Maastricht. This event will take place on tuesday the 28th of April at 8pm. We will be reserving a couple of tables so we can all play a couple of games. The exact price will be determined by the amount of people who are actually there, but if you bring 6 euros this should be more than enough. What is the secret of monkey island? many strong men and women have pondered this question for ages. On Monday the 13th of April from 19:00 until 22:00 you will be the new innitiates who will try to find an answer to this question. You will have to run, climb, jump, evade and show that you are strong enough to face the truth that lies behind the secret. The location of the island is Sportzaal Biesland at Athoslaan 24 (maastricht), but beware, you might not return in one piece. To join you will have to bring the monkey gods a sacrifice of 5 euros, in return the gods will provide some drinks and snacks to aid you on your quest. If you think you are worthy, fill in the form below so we know how many allies we will have during our quest. Block Openings Drink 5: Flower Power! It’s the start of the last lecture block. This, of course, will be celebrated with yet another drink. This drink’s theme is Flower Power! This means: put on your brightest clothes and party like you’re in the 60s! The drink will be held on Wednesday, 8 April 2015, starting at 20:30. As usual, the drink will be at café De Twee Heeren, Platielstraat 17-19, Maastricht. We have our own room upstairs, you can get there by taking the door on the right side of the cafe, or on the left side of the bar (you might have to ask a bartender to open the door for you). From the 17th of April till the 19th of April Incognito organizes MysteryLAN 2015 for all students on the Department of Knowledge Engineering. Here you get a chance to show off your epic skills during a weekend filled with gaming! This weekend starts on Friday after the lectures at Maasboulevard 1, 6211 JW, Maastricht. €25 when you want to join and become a member. This gets you a chair and part of a table. Don’t forget to bring your own network cable and the food/drinks you want to drink during the weekend! You can sign up at http://mysterylan.nl/join-the-fun/. It’s time for movie night. We are probably going to watch Toy Story, starting from the first one and see how far we get. Bring a pillow, let’s get cozy and relive our childhood! It’s on the second floor of De Twee Heeren, not the first one. Room 2, all the way upstairs!!! It’s time for KafE! This time Pieter Collins returns with a follow up talk about his software tool Ariadne, Don’t worry if you missed last years talk (Verification of Cyber-Physical Systems), this is for everyone: from first year bachelors to his fellow colleagues. Abstract: Although computers are capable of performing trillions of logical and arithmetical operations without making a single error, most computational mathematical software makes so many (tiny) approximations that the results are really only a (very good) guess. For us knowledge engineers, this really isn’t good enough, we want to know for sure our results are correct! For many years I have been working on a software tool “Ariadne” for proper, rigorous numerical computation with real numbers providing guaranteed bounds on all errors made. The original aim, as discussed in my previous KafE talk “Verification of Cyber-Physical Systems”, was to be able to prove that dynamic control systems, like robots, do what you want them to. But since this problem requires us to rigorously solve all kinds of difficult problems in continuous mathematics, the tool also provides a C++ library and Python scripting environment for general-purpose rigorous numerical computation. In this talk, I will give you a tutorial on the design and use of Ariadne, a tour-de-force of knowledge engineering combining logic, algebra, calculus, numerics, simulation, optimization, data structures and modelling, with some things which you don’t know but should, like interval arithmetic. I will also talk about the development process, which will mostly be explaining all the things that can go wrong if you don’t apply what you learnt in your software engineering course. Block 4 is here, and to already prepare everyone for what is to come, we will already start the block off with a little brain trainer. we will be having a PUB QUIZ to start off this block openings drink. In this quiz we will test you on general knowledge. during this drink we will alsoo start a little something called “THE DARE INITIATIVE” but this will be explained at the drink itself. The drink will be held on Wednesday, 4 Februari 2015, starting at 20:30. As usual, the drink will be at café De Twee Heeren, Platielstraat 17-19, Maastricht. We have our own room upstairs, you can get there by taking the door on the right side of the cafe, or on the left side of the bar (you might have to ask a bartender to open the door for you). it is the beginning of the new year, and what a better way to celebrate this than with good company and a drink or two. The drink will be held on Wednesday, 7 Januari 2015, starting at 20:30. As usual, the drink will be at café De Twee Heeren, Platielstraat 17-19, Maastricht. We have our own room upstairs, you can get there by taking the door on the right side of the cafe, or on the left side of the bar (you might have to ask a bartender to open the door for you). Dear members of Incognito and other study associations. The beer and bar committeeTasKE would like to invite you to the final social event of the calendar year. The Christmas pub crawl. Starting inside Peter’s Irish Pub on the markt at 20:30 on the 3rd December where TasKE will be waiting. we shall traverse this fine city of ours and hopefully discover places new and interesting for you. Slacklining is a practice in balance that typically uses nylon or polyester webbing tensioned between two anchor points. Many people suggest slacklining is distinct from tightrope walking in that the line is not held rigidly taut (although it is still under some tension); it is instead dynamic, stretching and bouncing like a long and narrow trampoline. This workshop is for people who are curious about slacklining and want to try it out. It’s inside at the gym with thick maths underneath the line, so ultra safe! From the 28th of November till the 30th of November Incognito organizes MysteryLAN 2014 for all students on the Department of Knowledge Engineering. Here you get a chance to show off your epic and nerdy game skills during a weekend full of gaming! You might even win some of the prizes! This weekend starts on Friday after the lectures at Maasboulevard 1, 6211 JW, Maastricht and we will start cleaning up Sunday in the afternoon. The subscription fee for the LAN party is €15 for members. The subscription fee for the LAN party is €20 for non-members. The subscription fee for the LAN party is €30 when you also want to become a member. Please read all rules and conditions for participation at http://mysterylan.nl/rules/ before signing up! Now that some of you have gotten somewhat skilled with the sword during the introduction weekend, it is now time to test your abilities with the bow and arrow. This will take place on Monday the 6th of October. It is highly recommended to come by bike since the shooting range is rather far away. We will be leaving at the Koningin Emmaplein around 18:30, so let’s meet there at 18:25.
eventually we will make our way here. It is still possible to come by foot but it will take you some time to get there. The prices are €7,50 for members and €8,50 for non-members. please bring this money in cash. to participate you will have to sign up below. It is time to get your gameface on and put your newly acquired knowledge from your maths subjects to the test. 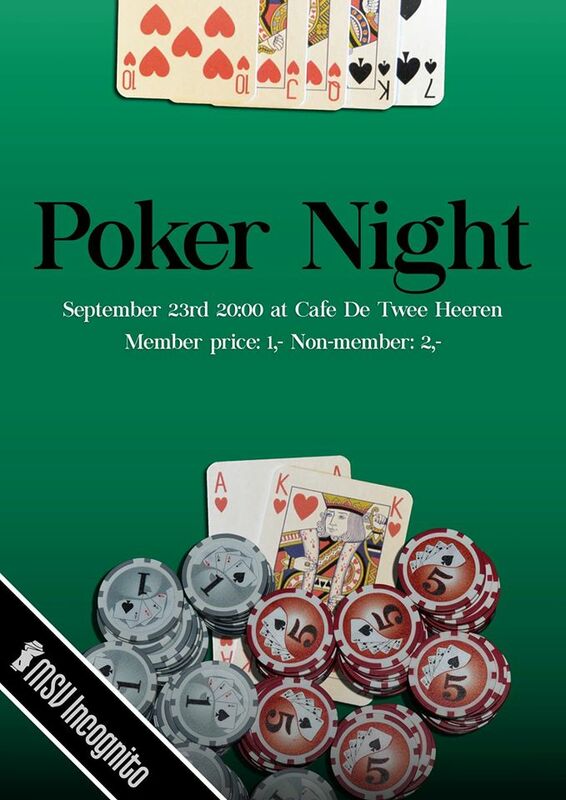 On the 23rd of September we will be having a casual poker night at our usual spot, upstairs at De Twee Heeren at 20:00. 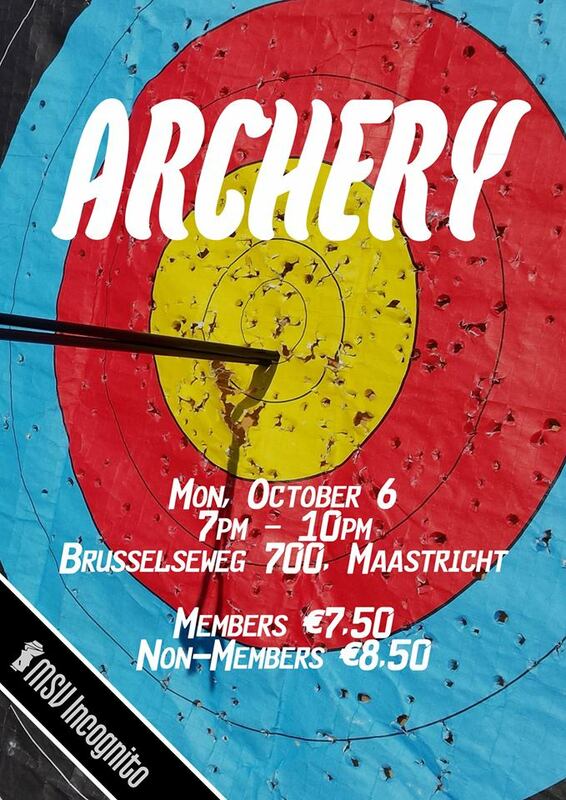 The price will be 1 euro for members and 2 euro for non members. We will supply some snacks and special prices for the winners. For drink however you will have to go downstairs and get it at the bar. 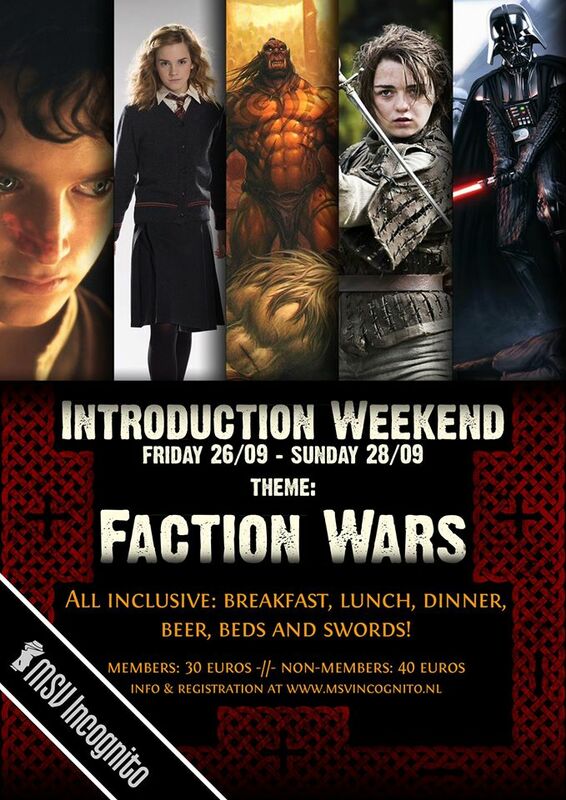 This year, we have an awesome theme connected to it: Faction Wars! This means that you will be able to fight for your faction and earn valor and recognition. Don’t worry about the entire weekend being full of role-playing, though; this is just the theme we decided to set the camp up with. The goal of the camp is to get to know each other and have fun! In this same spirit, there will also be no strange initiation rituals! The price for this weekend is 30 euro for Incognito Members and 40 for non-Incognito members. You will be able to register for the weekend by going to http://www.msvincognito.nl/incognito/introweekend/ and filling out the form. We still need cars to be able to get to the weekend! If you have a car and/or a driver’s license, let us know! Transportation costs will of course be covered by Incognito. The school year has started yet again. As we prepare ourselves for another fruitful year with interesting lectures it is also time to celebrate this new school year with a drink. 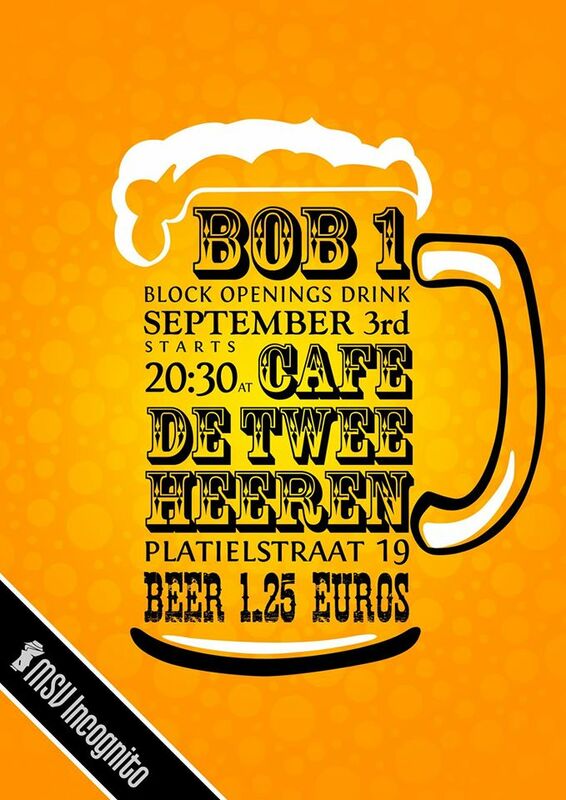 The drink will be held on Wednesday, 3 september 2014, starting at 20:30. As usual, the drink will be at café De Twee Heeren, Platielstraat 17-19, Maastricht. We have our own room upstairs, you can get there by taking the door on the right side of the cafe, or on the left side of the bar (you might have to ask a bartender to open the door for you). Beer, as usual, is 1,25 each. the year is over, it is time to say goodbye. 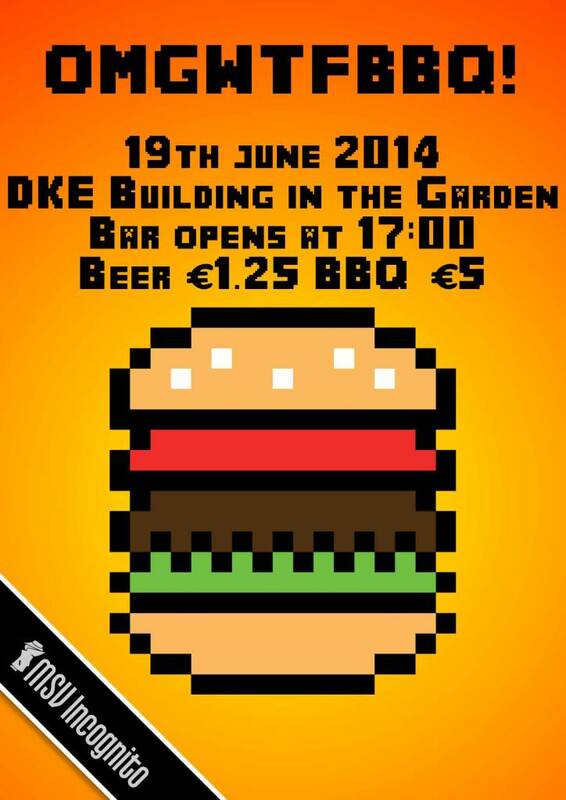 Of course this will be done just like we do it every year: A barbecue at the faculty!on the 19th of June you can hop by the garden of DKE to get some nicely roasted meat and a couple of tasty drinks.the barbecue itself will be 5 euros. This will cover all the food there. The bar opens at 17:00 and beer will be of the same price as the BOBs (1,25 euros each). of course other drinks will be available as well. Do you think you’re the best programmer of DKE? Or do you just want to practice your coding skills, look at some interesting problems and have fun? 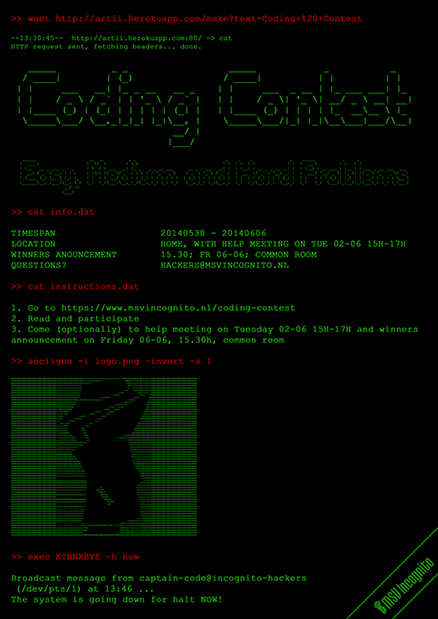 Then the coding contest is for you! There will be a help meeting (or join if you don’t need help, but just want to work together) on Tuesday 02-06 from 15h until 17h in the common room. Here you can ask all questions. Also, you can earn points with handing in your solutions (see the page for full details) and a leaderboard will be published daily. The person with the most points on Friday 06-06 wins the contest and will be announced in the common room at 15.30.